Back issues of ACE 2014 Issue A. Does not carry CME credit. Valuable compendium of classic clinical knowledge. Portable paper versions only. 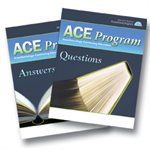 NOTE: Residents can purchase back issues of ACE at the same discount as current issues - call (630) 912-2552 for more information. This activity is intended for anesthesiologists, anesthesia residents, and members of the anesthesia care team.